The cosmic object has a mass of 6.5 billion times our Sun, and is bigger than our solar system. The photograph depicts a ring of light surrounding a shadow, which researchers at EHT explain is caused by “gravitational bending and capture of light by the event horizon”. 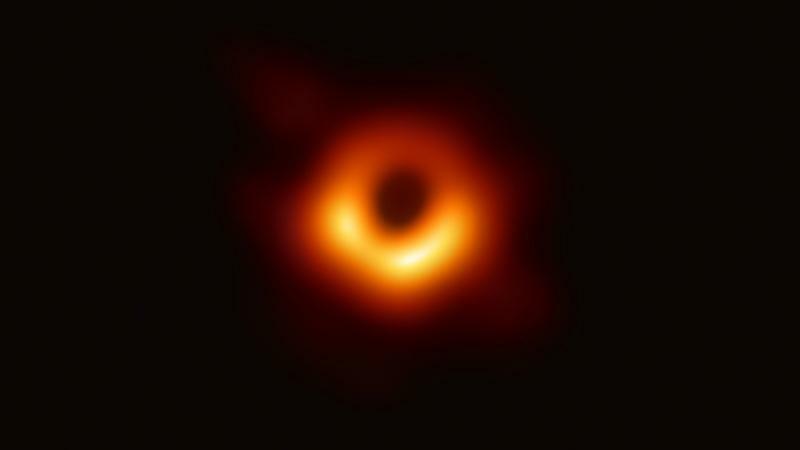 “We have taken the first picture of a black hole," said EHT project director Sheperd S. Doeleman of the Center for Astrophysics at Harvard & Smithsonian. "This is an extraordinary scientific feat accomplished by a team of more than 200 researchers." The black hole is located 55 million light years from Earth, and has a mass of 6.5 billion times that of our Sun. It measures 40 billion kilometers across, which is three million times the size of our planet and bigger than our entire solar system, and is located in the M87 galaxy. "If immersed in a bright region, like a disc of glowing gas, we expect a black hole to create a dark region similar to a shadow — something predicted by Einstein’s general relativity that we’ve never seen before,” explained Heino Falcke, who acts as chair of the EHT Science Council of Radboud University in the Netherlands. "This shadow, caused by the gravitational bending and capture of light by the event horizon, reveals a lot about the nature of these fascinating objects and allowed us to measure the enormous mass of M87’s black hole." The Event Horizon Telescope itself is actually made up of eight telescopes linked together, which orbit the Earth and use the planet’s rotation to aid in capturing incredible images. The network received extensive upgrades, which aided the years-long project. Scientists were able to verify what they were seeing after the black hole’s shadow persisted over multiple independent EHT observations. The discovery was announced today in a series of six papers published in The Astrophysical Journal Letters. When I read this, I wonder what went wrong with my education. My mind simply cannot comprehend such vastness. Decades ago i tried to read Stephen Hawkins "A Brief History of Time". I gave up after a few dozen pages. My mind simply cannot comprehend such vastness. I doubt that any human mind can truly grasp it. We can accept it, but trying to actually comprehend it - that's a different matter. If you can, I suggest watching "How the Universe Works" and "Space's Deepest Secrets." Both of those series do the best job of all I've seen in explaining all this in an understandable way.